This October we’re promoting #BreastCancerAwarenessMonth by sharing the heartbreaking tale of Catherine Booth’s diagnosis and subsequent death from that very disease (ironically in the month of October). Some of it is hard to read, most of it isn’t very pretty… but it’s a story that must be told in the hopes that it leads to even one person getting checked. These posts were created from piecing together excerpts from The Life of General William Booth, Volume II, by Harold Begbie, The Short Life of Catherine Booth, by Frederick Booth Tucker and Trumpet of Salvation by Norman Nygaard. Some language has been updated/changed for ease of reading. If there’s one aspect of Catherine Booth’s life that we’re familiar with, outside of her role as Mother of The Salvation Army, it’s that she was delicate in health and had been battling illness since childhood. Through decades of preaching, teaching and writing, through the births and raising of eight children, through ministering on the streets and hours and hours spent kneeling in prayer with this or that sinner – Catherine was in near constant pain. In 1887, life was especially hard for her – she suffered more than usual yet maintained such a courageous stand in the battle that few outside of the immediate home circle knew anything of her hand-to-hand struggle with weakness and weariness. After two days of preaching in Bristol in February 1888, William and Catherine returned home to London. Anxious about her health, she went to consult a great doctor and get his opinion. She was alone, for no one had thought her illness so serious. She asked him to tell her the truth – all her life, as you know, she wanted the truth; and after a little hesitation he told her. It was the saddest that she could hear. That dreadful illness – cancer – through which she had so tenderly nursed her own dear mother, had come to her, and in the doctor’s opinion she had much suffering to pass through, and had only eighteen months, at the most two years, to live. Catherine listened calmly, thanked the doctor, and then, getting once more into the cab, drove home alone. It was a dark journey. “After hearing the verdict of the doctors, she drove home alone. That journey can better be imagined than described. She afterwards told me how, as she looked upon the various scenes through the cab window, it seemed that the sentence of death had been passed upon everything: how she knelt upon the cab floor and wrestled in prayer with God; of the unutterable yearnings over me and the children that filled her heart; how the realization of our grief swept over her, and the uncertainties of the near future, when she would no longer be with us. The painful news of Catherine’s cancer fell upon every heart in the family with crushing force. The household was indeed a vale of tears. They loved their mother with a passionate tenderness rarely seen. Their life still centered itself around hers in almost as much as in nursery days. She was still the trusted repository of their every sorrow, their counselor in every perplexity, the guardian angel of their lives. “We look at one another through our tears, and cannot speak,” writes daughter Emma. (William Booth) “Never shall I forget starting out that evening, with the mournful tidings weighing like lead upon my heart. Oh! The conflict of that night journey! I faced two large congregations (that day) and did my best, although it seemed I spoke as one in a dream. Leaving the meetings to be continued by others, I returned to London the following evening. Then followed conferences and controversies interminable as to the course of treatment which might be wisest to pursue. Catherine’s objections to an operation finally triumphed. Instead of immediately laying aside her work when the doctors gave their dreadful judgment and beginning to think only of herself, Catherine went on with it as long as her increasing weakness allowed. ‘The war must go on’ became her motto. But step-by-step the disease grew worse. First she was forced to give up Meetings and public work. Then it became impossible for her to use her right hand, and she was therefore obliged to give up her correspondence, though she still continued to dictate her letters, and learnt also to write with her left hand. Catherine took part in remedies during her illness, but they only seemed to procure a temporary and partial relief of the anguish. The most remarkable effect of them was in arresting the violent hemorrhages that set in from time to time, and in soothing the more violent spasms of pain. It was in the spring of 1889 that Catherine’s medical friends came to her with a newly discovered cancer cure. The treatment was an electrical operation, which consisted of transmitting intermittent currents through needles inserted under the skin, and had been reported favorably on by the British Medical Journal. The theory of it appealed to both Catherine and William and it was decided, after much prayer and deliberation, that the experiment should be made. That fall the household moved to Clacton-on-Sea, where William rented the Army’s Home of Rest. During the first month or so of her stay, Catherine was able to go out for a daily drive in a borrowed carriage. But such was the effect of the motion upon her that, some five weeks after her arrival, the morning of her last ride came. Having ventured only a few yards, she bid her daughter Emma to turn around and return her to the house. Then came the slow walks upon the cliffs, where she was often seen leaning upon the arm of her husband or some member of the family. And then came the last walk. Thus by degrees she became confined to the house. But even then she would come downstairs for as long as it was at all possible until she was unable to even leave her bed. They placed it where she could still look out across the sea, and some of her most inspired messages were delivered while her eyes rested upon its ever-changing tide. Some people can do more with the lifting of a finger than others can do with their whole body… In sickness, and even in death, they accomplish more than others in health and life. This was true in a singular degree of Catherine Booth. 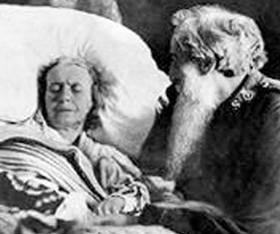 The sickbed proved for her a worldwide platform from which her very sufferings enabled her to preach the most eloquent and heart-appealing sermons of her life. Again and again, Bramwell Booth tells me, his father broke down utterly when he came from his wife’s room to take up the accumulating burden of his work for the Army. “I don’t understand it! I don’t understand it!” he would cry out, and covering his face with his hands, he would walk to and fro in an excess of grief, or throw himself upon his knees and implore the Almighty for help. During December of 1889, Catherine passed through one of the most painful and prolonged crises of her illness, and it was evident that any moment might be her last… From December 15th through the 24th, she seemed to be treading the valley of death, and the absent members of her family were hastily summoned to her side. William writes, “Sunday, December 15th – My darling had a night of agony. When I went into her room at 2am she had not closed her eyes. The breast was in awful condition. They were endeavoring to staunch a fresh hemorrhage. Everything was saturated in blood. To stand by the side of those you love and watch the ebbing tide of life, unable to stem it or to ease the anguish, while the stabs of pain makes the eyes flash fire and every limb and nerve quiver, forcing cries of suffering from the courageous soul – is an experience of sorrow which words can but poorly describe. Over and over, during the progress of the illness, it was thought that Catherine was dying. The doctor said that her hours were numbered. She believed so herself. And yet she rallied. “I imagine that it must be the prayers of our family and the many thousands of people whose lives she has blessed,” William replied. To admire such heroism at a distance is not difficult; but to live side by side with it, day after day, year after year, is difficult to the point of torture. And when we remember that she who suffered so terribly and he who comforted and consoled so diligently, were engaged in proclaiming to the indifferent masses of the world God’s longing to help, God’s passionate desire to heal and restore, we may faintly realize the soul of their tragedy, so full of pathos, so shot with irony. In the winter, Catherine asked for the Army flag to be brought and fastened above her head… As she had fought beneath its folds in life, so now in death she rejoiced to realize that the “banner of love,” which had been the herald of salvation to multitudes, was still waving over her. “It ought to be ‘Blood and Fire and Victory,” her husband replied. In the fall of 1890, Catherine was doing so well that her physicians thought she would see the New Year. It wasn’t long after, on October 1st, 1890, that a violent hemorrhage set in, and this time, death seemed imminent. The family was summoned to Catherine’s bedside one last time. We shall walk through the Valley in peace! Fainter and fainter grew the breathing, while more and more clearly were assurance of peace written upon that dear-loved countenance; till at length, with one deep sigh, without a struggle, the silver cord was loosed and the golden bowl broken, and the unfettered soul fled away to the land where sorrow and suffering shall be no more, and where God’s own hand shall wipe away all tears. It was half past three on Saturday afternoon, the 4th of October. The storm of the previous night had passed away. The sun was sinking in an almost cloudless sky. The singing of the lark, and the dull murmur of the waves beating on the shore – all seemed as though nature was seeking through God’s handiwork to speak peace to the troubled souls of the bereaved, reminding them through the beauties of that exceptionally perfect autumn day that their loved one had entered upon a world whose glory eye hath not seen, nor ear heard, neither hath it entered into the heart of man to conceive. It is impossible to describe the sense of utter desolation, which swept over that home as the realization of their great and irreparable loss made itself felt. But as father and children embraced one another in that sacred room, each sought to hide the anguish of their individual grief in striving to bring comfort to the other… It seemed to each member of that family as if an avalanche of sorrow had been let loose, making all other troubles seem as mere snowflakes. Writing to the War Cry, William announces his beloved’s death. “Yes, like a dream the event has come and gone. Anticipated, the uppermost thought in my mind, known to be inevitable for two long years and eight months, dreaded as one of the darkest human shadows that could fall upon my poor life, death has come and taken away my darling wife, the beloved partner of my soul. And now occurred a series of vast and imposing spectacles, seldom paralleled in the history of the world. The woman who had, perhaps of all others, the least coveted popularity received a tribute of genuine and worldwide esteem, which was as unanimous as it was unstinted and generous. On Tuesday, 4,000 people passed through the hall to say goodbye, on Wednesday 10,000, on Thursday 14,000 and on Friday 13,000. Monday, her body was moved to a new hall, where 36,000 people crowded in to bear witness to the service. A fog, which had prevailed during the afternoon, had crept into the hall, and hung in fleecy folds along the roof, dimming the dazzling brilliance of the large electric lamps, and adding not a little to the weirdness of the scene. “Even nature is mourning,” remarked one officer. “You will readily understand that I find it a difficulty to talk to you this afternoon. To begin with, I could not be willing to talk without an attempt to make you hear, and sorrow doesn’t feel like shouting. Yet I cannot resist the opportunity of looking you in the face and blessing you in the name of the Lord, and in the name of our beloved one who is looking down upon us, if she is not actually with us in this throng today.